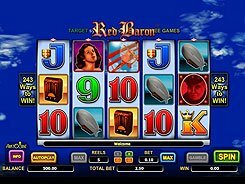 This is a 243 ways to win slot with its main focus being on a legendary World War I pilot, Red Baron. The action takes place on five reels, but you may lower the number of reels you would like to play. If having all five reels activated, a total bet would range from $0.5 to $100 per spin. The Medal is a wild symbol that replaces all other icons including scatters, but does not create its own winning combinations. The Target acts as a scatter and appears on three central reels only. Three or more scattered Targets trigger 15 free spins and the Mission feature. During the free spins, every time the Plane symbol lands anywhere in view, it adds to the meter above the reels. When the counter hits 4, you are awarded a win of x10 times a total bet; when the counter shows 8, you would grab a win of x15 times your bet. Overall, the largest cash prize in the Free Spin Mission feature may reach a stunning $14,000 on the max stake. Furthermore, all wins with a wild symbol used as a substitute are multiplied by x2, x3 or x5, during the free spin round.